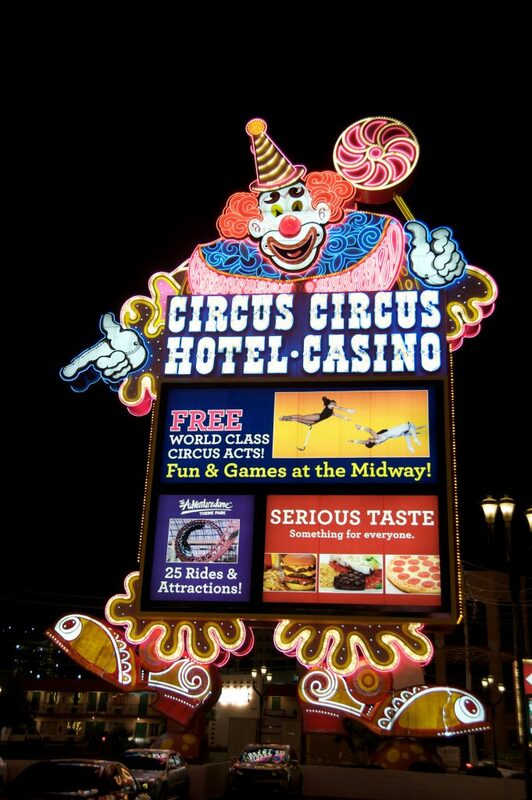 Circus Circus is a hotel-casino and RV park situated on the Strip in Winchester, Nevada. 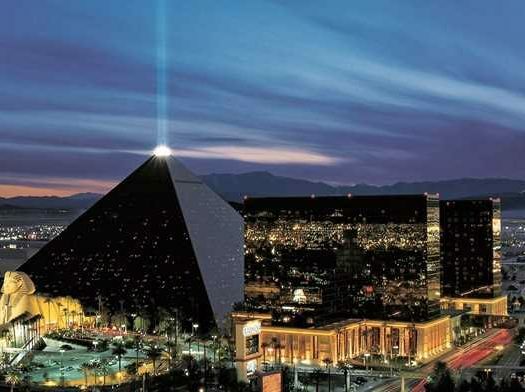 It’s owned by a hospitality and entertainment company known as MGM Resorts International. It features carnival type games and circus acts daily on the Midway, and it’s the world’s largest permanent big top. The Lucky The Clown marquee seen at the entrance of Circus Circus was provided by YESCO (Young Electric Sign Company), and it was built in 1976. Circus Circus previous owners were Stanley Mallin and Jay Sarno (1968 to 1974) and Mandalay Resort Group, which was formerly called Circus Circus Enterprises (1974 to 2005). 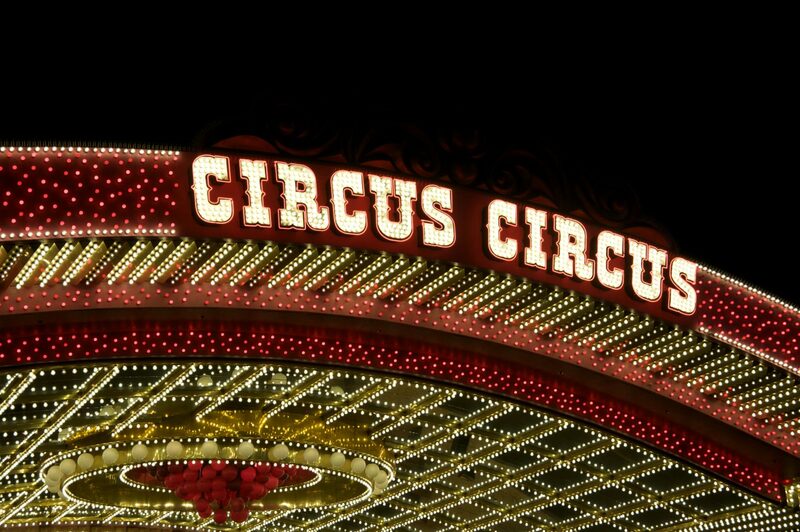 Circus Circus was officially opened to the public on Oct. 18, 1968 by Stanley Mallina and Jay Sarno and became Circus Circus Enterprises’ flagship casino. Architects Rissman Associates and Rissman designed an enormous circus tent shaped main structure, built by Las Vegas-based R.C. Johnson Construction. At its opening, the 15-million-dollar facility only included a section for gambling. The Teamsters Pension Fund gave Sarno 23 million dollars as a loan to help in the construction of a hotel. The Chicago Outfit’s enforcer called Anthony Spilotro (under Tony Stuart name) was granted a concession of a gift shop in the hotel as part of the agreement. Ownership changed in 1974 with the sale of the gambling house to William Pennington and William Bennett for 25 million dollars. The facility was expanded and there were hotel tower additions between 1972 and 1996. The carnival-themed Circus Circus entertains guests with clowns, jugglers, and acrobats performing for free above the main floor. It lures lots of families because it offers many activities for children. The Adventuredome theme park is the biggest feature. This gives the kids something to do while the adults are gambling. Circus Circus has over 3,700 rooms and suites located in several buildings. The 15-story Casino Tower is the freshest remodelled room type decorated in modern jewel and earth tones. The West and Skyrise Tower are the other standard types of guest rooms available at Circus Circus. Skyrise Tower room has everyday comfort in gold and purple jewel tones and nice patterned carpeting. In the thirty-five-story West Tower, modern comfort meets functional design. Rooms start at 21 dollars during the week and 89 dollars on weekends. There is also a 14.50-dollar per night resort fee. Additionally, there is an RV park and a motor lodge. Circus Circus Manor Motor Lodge is decorated in beautiful desert-sunset tones, and it features Wi-Fi internet access, TV, and updated furnishings. The RV Park is the only one available on the Strip, and it can be accessed through the back entrance found on Industrial road. It’s the perfect place for visitors to stay and camp. For those seeking an upgraded experience, Circus Circus has elegantly appointed accommodations from one-bedroom to parlor suites to luxurious multiple levels, roman tub suites. There are also wheelchair accessible rooms with roll-in showers. Circus Circus also offers salon services, including facials, spray tanning, massage, body wrap, waxing, and threading. Whether you want an intimate gathering or a lavish wedding reception that will host all your friends and family members, Circus Circus Las Vegas is here to make that dream come true. Circus Circus offers meeting and banquet space that can hold up to 600 people. They are expertly equipped to host as well as cater to any function, including formal banquets, business meetings, and cocktail parties. 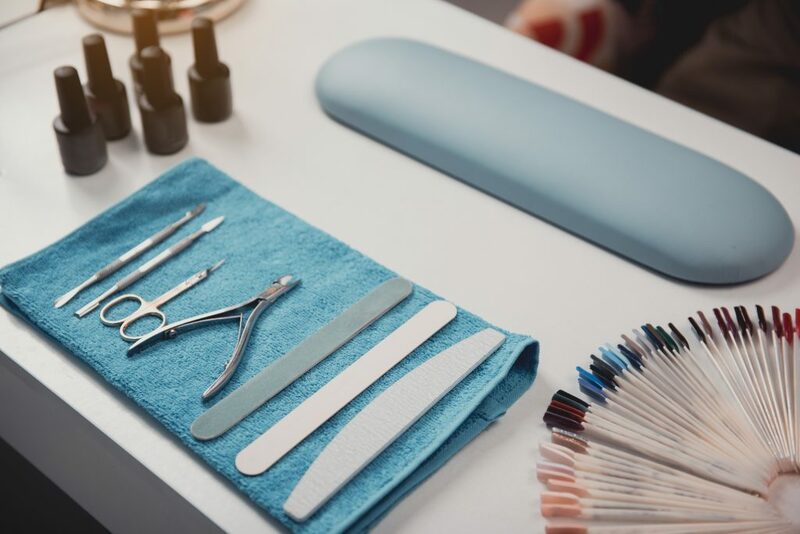 You can select from their exclusive wide variety of live entertainment plus menu packages, or you can allow them the opportunity of customizing a plan for you. Vince Neil’s Eat-Drink-Party, owned by Mötley Crüe’s lead singer, has recreated the look and feel of vintage. The Big Chill bar serves guests frozen drinks in a specialty glass. They offer great prices on refills. Also, draft and bottled beers are available. The West Bar is a full bar and specialty glasses are available. The bar has TVs, so you can drink while watching major sporting events and teams. There are 2 bars in the gambling section: one is in the lobby area, while the other is located near the sports book. Cactus Bar is within the Adventuredome. This 5-acre amusement park is inside a huge pink glass dome that’s connected to the hotel. It offers twenty-five rides and attractions including, carnival-type games, Midway Games, Virtual Reality Zone, Pikes Pass, Xtreme Zone, clown shows, an arcade, eighteen-hole miniature golf course, rock climbing wall, and the Canyon Blaster roller coaster. Experience every twist, turn, plus drop with rides and attractions that include kid-friendly and daredevil. Lace up and roll at Roller Skating Rink. You can go with your won roller skates or rent at the park. With Xtreme Zone, you can take a stab at bungee jumping and rock climbing indoors. Nothing beats the time-honored midway games tradition like balloon bust, mini basketball, darts, and many more. Guests get to show their skills and win amazing prizes. The latest arcade video games allow guests to get their fill of video games thrills. You can also find classic arcade games in the unlimited classic arcade area and play all day. Knock down the competition with the ultimate mini bowling experience that Highway 66 offers. Frog Hopper will have guests leaping for joy. To ride Frog Hopper, your height must be between 36 inches and 58 inches. Get on the B.C. Bus with family and have a blast as you go up, down, and round. To ride B.C. Bus, you have to be 36 inches or taller, unless you are accompanied by a paying adult. There are also free circus acts at Circus Circus with performances starting every day at 11:30 a.m. You will have a chance to experience the largest permanent circus in the world, highlighting Carnival Midway’s center stage. The Splash Zone opened in 2017 and covers more than one acre. 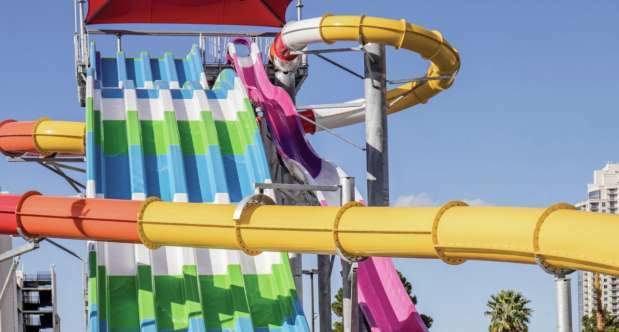 The newly expanded pool experience at Circus Circus features a 50-foot waterslide tower that has splash buckets, Splash Pad (a playground for all age groups with waterfalls), and three exciting slides, as well as Splash Snacks food truck plus Cabanas for rent. Circus Circus Las Vegas offers a wide variety of stores filled with Vegas souvenirs, gifts, fashionable apparel, a variety of liquor bottles, juices, milk, soft drinks, beer, snack foods, newspapers, sundries, and tobacco products. The 40,000 sq.ft. shopping Promenade is the perfect place for perusing and getting unique items. These shops include IT’S VEGAS, Circus Spirits, Gifts 4 Less, Market Express, Circus Market, Headliners Slots-A-Fun Gift Shop, Snacks and Things, Trading Post, and Midway Gift Shop. Circus Circus has 126,000 square foot gaming space with table games and slot games. There are twenty-five 6-deck blackjack tables at Circus Circus. Some of these blackjack tables pay 6-5. The betting range is 5-500 dollars. There are several 5 to 500-dollar single deck tables plus a few 10 to 500-dollar double deck games. In the double deck games, you cannot double after splitting. All blackjack games hit soft 17. Two crap tables that have double odds are offering the same limits. For those who love playing roulette, there are five 5 to 1,000-dollar roulette tables with 2 zeros. There are 3 Pai Gow Poker tables with 10-1,000-dollar limits. Poker games include 5 to 100-dollar Three Card Poker, Mississippi Stud, and Let it Ride. There is a Big Wheel game that has a one-dollar minimum bet. Full pay Aces and Eights video poker is available in the 0.50 dollar denominations. Also, there is 9/6 Bonus Poker Deluxe plus lots of 8/5 Bonus Poker machines that have progressive jackpots for four of a kind and royal flush. While MGM Resorts owns Circus Circus, it doesn’t use its MLife card. It has its own player’s club; the neighboring Slots A Fun also use it. Circus Circus has the latest video slot, and table games, starting from 0.01 to 25-dollar machines in 4 casinos: Slots A Fun, Skyrise, West, and Main.  Slots A Fun has several video versions of popular table games with one-dollar minimum bets. There is 1 Shoot to Win craps, 3 Shuffle Master blackjack machines, and one Interblock double zero roulette machine. The limits at video blackjack games are 1 to 300 dollars. You can double down after splitting and on any 2 cards. Surrender is available and the dealer must stand on all 17. The game takes the Circus players card and adds 0.1 percent to the return. There is a video greyhound racing game that allows you to bet on past recorded dog races results. All machines use TITO technology (ticket-in/ticket-out). The bar is often staffed 24 hours a day. Certain beers plus other drinks are given free to slot players. Virtually all different games you desire are available throughout the casinos and are sure to satisfy all keno and poker players. From caveman keno to four card keno to triple play keno. Aces and Eights progressive poker is also available, and it was developed particularly for Circus Circus. It features 0.25-dollar jackpots starting at 12,500 dollars. Play the Carousel, which is the only Circus Carousel in Las Vegas that spins while you are playing your favorite penny slot machine and watching the Circus Acts. You can also play Magnificent 7’s, one of the classic 1-dollar slot and favorite among regulars and locals. With frequent 1000-dollar Jackpots, guests can choose from the TITO payouts or old fashioned coin payouts. Those with Circus Players Club card can participate in 50,000-dollar slot tournaments (Wild Wild West and Glitz & Glam). You can join any of these tournaments for a 75-dollar entry fee. Non-invited guests are also welcomed to these events for a 75-dollar entry fee. The race and sportsbook at Circus Circus offers a comfortable, intimate ambiance ideal for guests who are looking for a great place to watch all the games. This room features seating for thirty people in the sports book and fifty in the race book (each having its own TV monitor). The resort offers daily lines (money lines, straight bets, and totals), propositions, futures, parlays, plus wagers on pari-mutuel horse racing and dog racing. Also, players can catch up on national events through an electronic display board. Players in the book are offered cocktail service, and they can also choose to head over to the nearby coffee shop, which offers a to-go menu. There is a Sports Bar adjacent to the Circus Circus’ sportsbook with 5 flat-screen TVs where players can also catch all the action. Comps for drinks and food are based on daily play. There are drawings every Monday night for losing parlay card wagers, and every week one winner gets ten times face value of the losing wager. Circus Circus has a lot of fast and convenient options when it comes to food. Circus Buffet offers traditional Vegas buffet for dinner and brunch including decadent desserts, all-you-can-eat delicious fried shrimp, American and International favorites, carving station, and salad bar. Kids under four years eat free if they come with a paying adult. The Pizzeria offers piping hot, freshly baked pizzas (which you can have with your favorite toppings) as well as sandwiches, salads, and calzones. 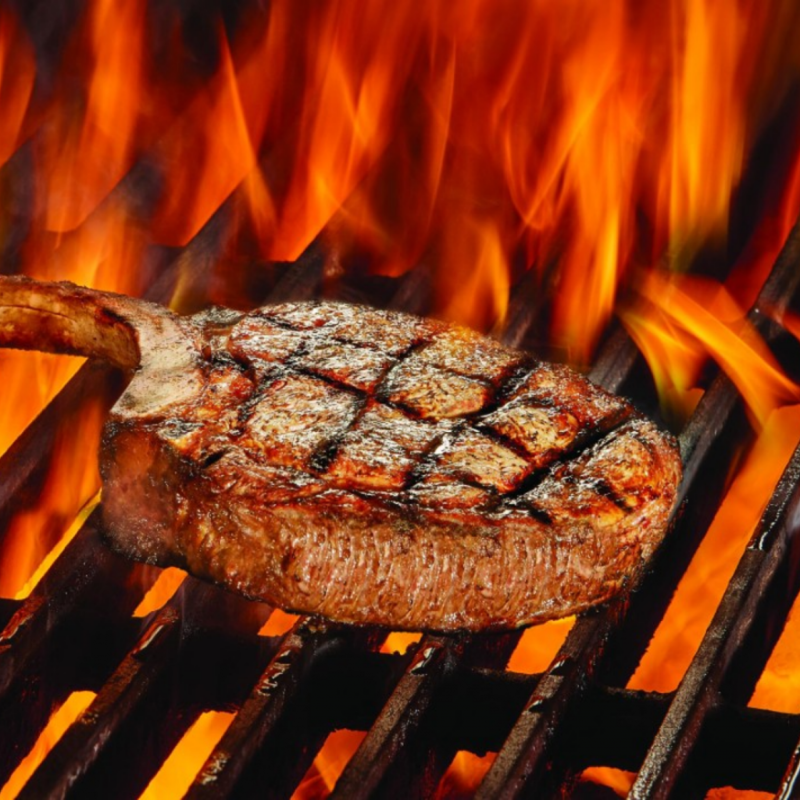 The award-winning THE Steak House offers mesquite charcoal-grilled steaks, juicy prime rib, and clubby ambiance with leather and mahogany. Westside Deli is open 24 hours, and it is a perfect place to satisfy your hunger with a wide selection of deli favorites. You can bite into a fresh deluxe deli sandwich, and enjoy fresh salads and soup, or a foot-long hot dog. It also features grilled chicken, chicken tenders, fries, and burgers. For delicious, quick, fresh, Mexican Cuisine, head over to Blue Iguana. From enchiladas and nachos to tacos and burritos, there’s something for everyone at affordable prices. Circus Circus Las Vegas was designed with the idea that families also needed somewhere to stay in Vegas. Since the topsy-turvy sixties, the resort has always been a fixture on the Las Vegas Strip. The resort is family-friendly, has access for guests with disabilities, the rooms are restaurants are inexpensive. 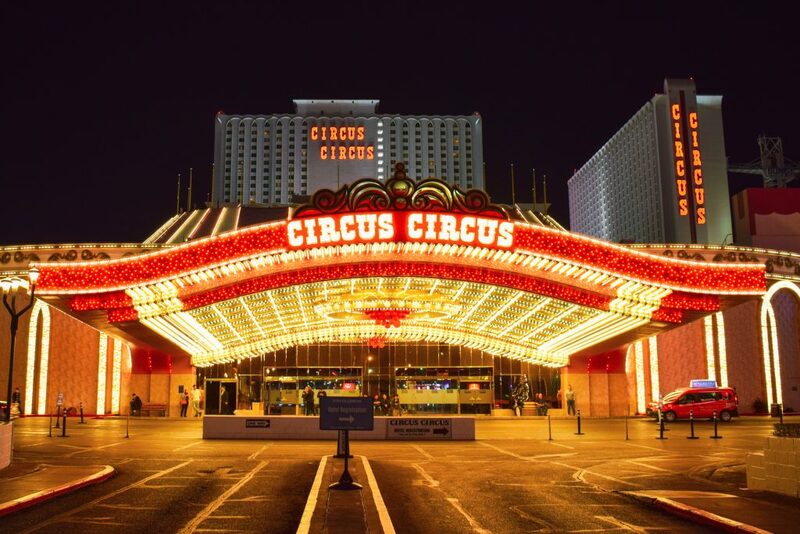 Circus Circus is a must-visit for budget travelers and families looking for a place to shop, dine, gamble, or have fun in Las Vegas.